Texas Instruments (TI) DLP Technology has been a world renowned technology for many years with its various current applications in business office and theater video projectors. The DMD (Digital Micro Mirror Device) is the key component that serves as the core of the digital light processing technology made of fabricated MEMS array in a mirror formation which utilize components in different mirrors available in various sizes (8um-11um) dependent on the type of modulator. 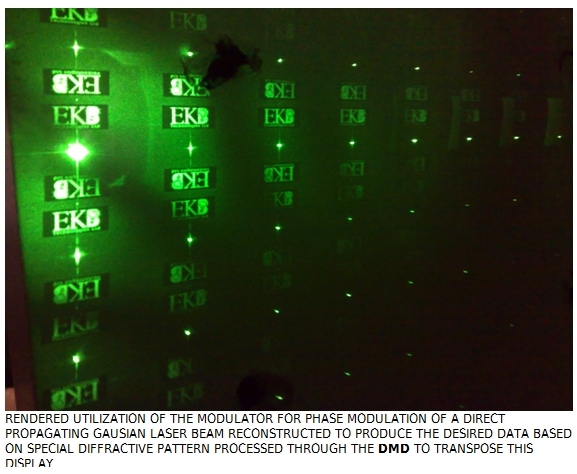 DMD belongs to a category of SLM which divert light in mirror/pixel levels allowing a tilt angle per mirror between +-12 degrees simultaneously performing modulation of the propagating light in amplitude level that can translate to a static or motion image when supported with imaging optics. In recent years, there have been great changes in integration of projection engines in new applications. A trend in implementing these light engines is evolving in commercial and industrial applications. 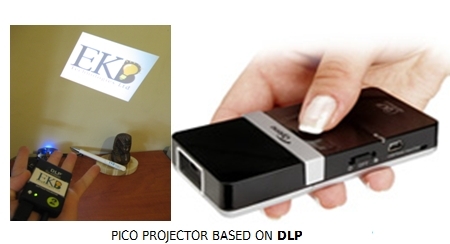 The popular growing application is Micro/Pico projection which is a miniature video projector that can project large image displays out of small devices such as portable light weight electronic devices. Efficiency in mobile electronics is essential in reducing size and heat dissipation while maximizing the operating time of small sized batteries. 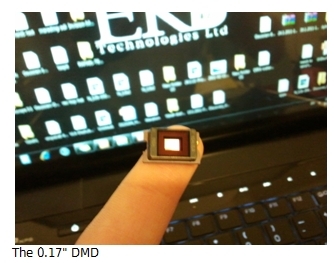 The DMD is a miniature component that can modulate light while maintaining high optical and electrical efficiency that makes this technology an attractive solution in mobile devices. For example, a DMD from the DLP1700 mini series (0.17", 0.3") is a miniaturized version designed by TI for the Pico projection market. Reflectivity of the mirrors is approximately 90% consisting of a fill factor of 92% with low electrical energy consumption (~84mw). Use of polarization became an efficiency barrier issue in different SLMs (LCOS, LCD) in the recent years with various companies that seek to bypass this requirement by utilizing polarized light sources (lasers) to improve optical efficiency and tackle the 50% efficiency drop off with conventional polarizers in those modulators. One of the many advantages of the DMD is it does not require usage of polarization to function in modulating the light, and it holds capabilities to perform under high powered illumination. DMD does not produce unwanted artifacts often seen in LCOS and LCD spatial light modulators which usually require special heat shielding in comparison. However, functionality of the LCOS and LCD SLMs are still polarization dependent while the 3D projection evolution grows with no dependency on polarization, but could use polarized light for different purposes separate from its own functionality in producing amplitude light modulation. This could serve in purposes of producing images changes commanding different polarization positions in 3D image production while polarization is being manipulated at the light source level. Until recently, there was no real significance on whether the SLM could cover a wide wavelength range since most of the conventional SLMs were applied in projection engines in the visible spectrum. Having an SLM able to modulate light at VIS was more than enough for most applications. However, many of the companies that use SLMs have been looking for options to overcome the high optical power propagating the SLMs to reduce unwanted TFT effects inside the modulators. Before the time of HB-LEDs when high power light bulbs where dominating the conventional light engine in video projection, IR filters were used to reduce accumulated heat from the surface of the SLM and minimize unwanted effects on its performance. The DMD technology is capable of working in a wide spectrum of wavelengths and this device have a significant advantage previously unrecognized until recently when new applications have evolved requiring use beyond VIS or simultaneously with VIS or other wavelengths across the spectrum. DMD technology has become a popular demand especially in commercial applications. As the trend continue towards 3D modeling applications, soon it will be possible to see this combining with VIS projection engines that are blended together with NIR that would allow user interactivity with the projected data. In 2011, evidence of an emerging demand can be seen in combining optical projection channels and sensors in devices such as cameras with a closed loop system especially in the field of image modeling of 3D structures (structured light applications). As the 3D mode thrives to dominate grabbing of 3D objects and projection of 3D data, there are strong growths of these applications in a variety of commercial and entertainment electronics entering into new market sections in the industry beyond conventional image projection ever known before. This is also true in invisible wavelength ranges at NIR and UV with propagating requirements for DUV especially for data applications and wafer inspections in the high tech industry. Frame refresh value is an issue with the sensor and projection levels in new applications requiring image grabbing of fast moving objects for 3D modeling that requires both channels to work quickly to obtain high sampling frequency of the objects. Depending on the model type, the DMD solution can work at several KHz as high as 32KHz with high refresh rates which presents many options for integrating the DMD as a high optical switch that could quickly toggle between different optical channels for projecting and/or sensing. 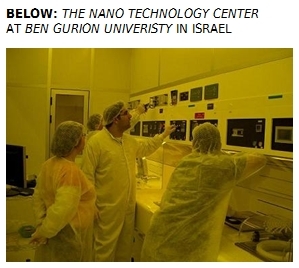 EKB Technologies LTD, an Israeli company, has successfully utilized the DMD to manipulate the phase of the light rather than amplitude to produce binary diffractive optical element in a lens free optical setup. 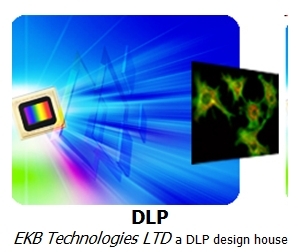 This utilization of the DMD allows EKB to cut down risks in design and production of complicated diffractive optical elements (i.e. phase masks). “Working with a variety of wavelengths opens new opportunities in new applications in different markets from commercial to military and medical fields”, says Sharon Kapellner Rabinovitz, Founder and CEO of EKB Technologies LTD.
A new leap in the vision of technology in miniature projection systems with VIS and NIR spectrums continue to emerge as it is expected to reach higher demands in the coming years when more light projection engines will be integrated in a variety of applications such as face recognition alarm systems, virtual keypads, material inspection systems, intercoms, vehicles with driver recognition and data projection, and digital cameras that allow recording of distance and physical measurements before the data can actually be saved or recorded. For example, using a closed loop projection system in devices such as mobile phones could become a measuring tool to capture an image of a furniture at a store which the system can then calculate the dimensions to determine the fit of the furniture for a designated area in a home. Other systems such as ATMs could utilize similar modules to allow user operation by "virtual touch" on a true touchless display integrated with VIS and NIR projection engine in one module. Virtual display does not have to originate from a specific frame or structure as it is becoming more natural to blend with the user by sensing user movements to project the information on surface(s) of possibly different shapes each time. One of its many useful applications can be valued in the medical field in ways the system could project information on the patient while simultaneously adjusting to stabilize itself with the data location of the patient’s body as he/she moves. Interactivity with user is the future with more applications emerging that would give support in that level. This April presents a great opportunity as DLP experts arrive in Israel from Texas Instruments corporate headquarters located in the USA in collaboration with EKB Technologies LTD to promote DLP familiarity in the Israeli high tech industry.